The SANA AGM will be held on Sunday the 28th February 2016, at 10.30am in the Green Hotel, The Muirs, Kinross, KY13 8AS. All Members and Member Clubs are invited to attend or be represented at this important meeting. The following reports will be presented at the AGM and are available below for the convenience of all. The above report can be found here. The Government has listened to the Angling Trust and others concerning damage being done to fish stocks by cormorants and goosanders in England and Wales, and has implemented new rules for their control. Read about it on the AT website at http://www.anglingtrust.net/news.asp?section=29&sectionTitle=Angling+Trust+News&page=2&itemid=1976 SANA has recently conducted a cormorant count in Scotland and is writing a report. We will be presenting its findings to SNH in due course with the hope they will take it seriously and beef up action here." The Aquaculture and Fisheries Act (Scotland) 2013 modernised the governance and management of salmon fisheries. During the passage of that Act, Ministers acknowledged that more must be done to ensure that the management system for all our wild fisheries (i.e. salmon and freshwater fish) is robust, sustainable and fit for purpose. a) develop and promote a modern, evidence-based management system for wild fisheries fit for purpose in the 21st century and capable of responding to our changing environment. b) manage, conserve and develop our wild fisheries to maximise the sustainable benefit of Scotland’s wild fish resources to the country as a whole and particularly to rural areas. A review group will be chaired by Mr Andrew Thin, the outgoing Chair of Scottish Natural Heritage. The structure and remit of this group will be announced by the Environment Minister, Mr Paul Wheelhouse. Mr Thin will start his work in March and it is anticipated that the Review will take about six months, and report to Ministers thereafter. Since this process is likely to lead to changes in legislation and local management SANA encourages all member clubs and individual members to participate in the process by clarifying their own views and submitting them to the review board and to SANA admin. when the opportunity arises. The Grayling Research Trust wants to put a handle on the timing of grayling spawning of which there is currently little information. It is therefore asking for anyone who has seen grayling actually spawning, or has information on the timing of them spawning, to send in details via a form on the Trust's website at http://www.graylingresearch.org/citizen-science/spawning-survey where there are also more details. Currently no information has been received from Scotland so any observations would be most welcome. Calum Robertson (on the right), the current Youth Team Captain has just got a job and a scholarship as a ghillie on the Spey. We wish him well. 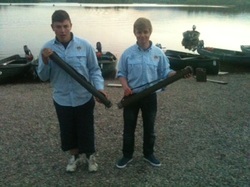 He is seen in the picture with Calum Clark both receiving river rods kindly donated by Craigallion Angling Club to help with their river experience. Another team member, Sean Queen, has been accepted for an Aquaculture course at Barony College. A great effort! All three are longstanding members of the Cormorants, at the Lake of Menteith.